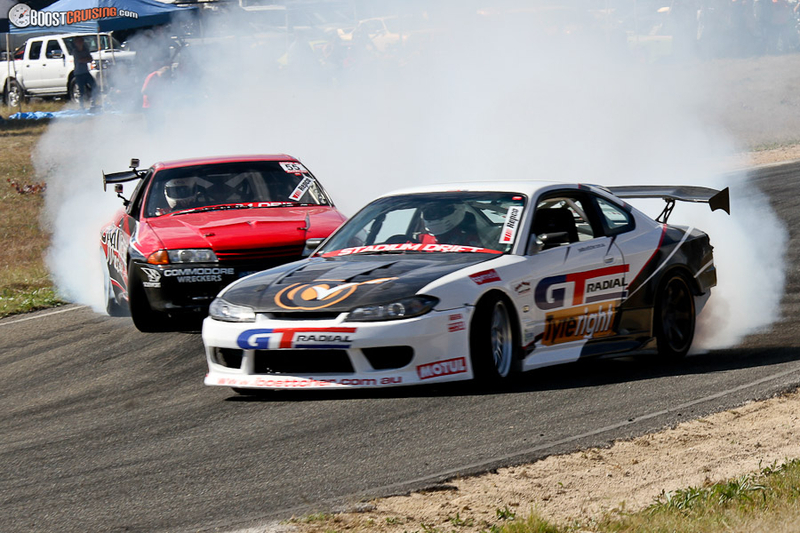 Last weekend saw our team head to Stanthorpe for Round 2 of the Repco Pro Drift Championship. 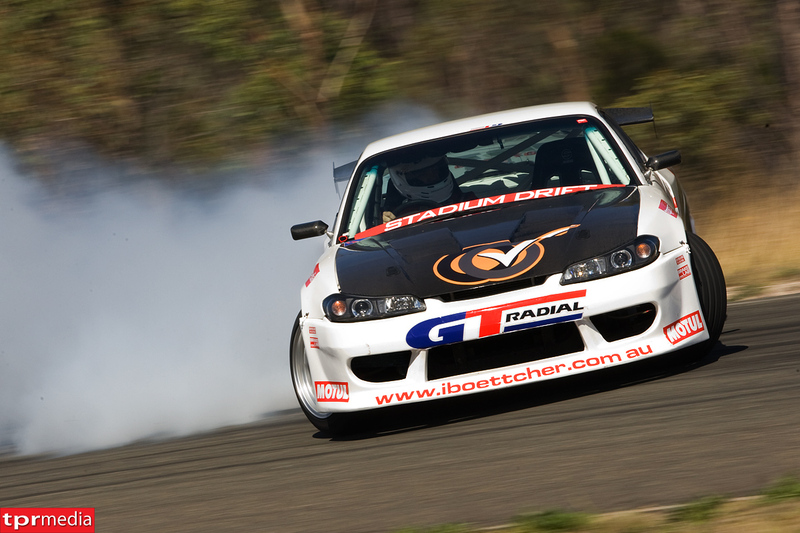 With the GT Radial S15 readied for it’s trip to Formula Drift Asia, this would be the last chance to make sure everything on the car was 100% before being packed into the container a few days later. We had spent a lot of time making sure the car was right, including a full engine refresh at Gavin Wood AutoTech and a rework of the wheel alignment thanks to our crew chief Daniel at Bundamba Tyreright. After an early start to the morning we arrived at the track and setup the Tyreright pit area ready for the day ahead. 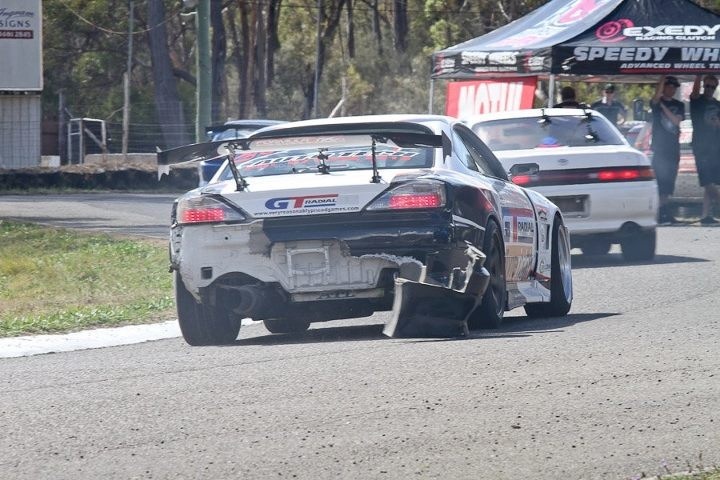 The Stanthorpe track is very hard on rear tyres as your right foot is flat on the floor for almost the entire track! 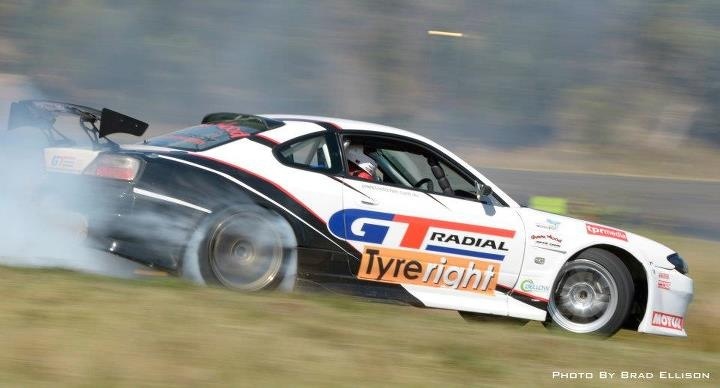 But the GT Radial HPY tyre gave me the grip and the tyre life to be confident each time I threw the car sideways at 100kph+! After the first couple of practice runs, Daniel adjusted the wheel alignment and the tyre pressures to suit the conditions and had the S15 ready to rock for the battles. The first battle didn’t go to plan. I got a little too close on the chase run and spun out. I knew it was going to be very tough to make the A main final after a spin, so I gave it everything in the rest of the heat battles. And when the heats were over, we found out we qualified 7th, and just made it in to the top 7 and the A main final! The first battle of the finals was up against round 1 winner, Tony Harrison. Tony had been on fire all day, and qualified in 2nd, so I knew it wouldn’t be easy. I was chasing first, so I pushed as hard as I could and was able to stay close to Tony for the whole run. On the chase lap, Tony was right on my door from the first corner. I could hear the V8 roar right there next to me the whole time so I pushed as hard as I could through the track. On the last corner I went in as fast as I could and was able to pull up just in time and then tucked back in to the inside clipping point. When I pulled up Daniel told me over the radio that Tony had straightened after chasing me hard into the last corner. Not long after, the officials gave us the nod, we were through to the top 4! My top 4 battle was up against Michael Rosenblatt. Michael is super consistent, so I made sure I stayed as close as possible on the chase run. I was right up on Michael’s door for the whole run until the last corner where he spun. It was a very close call and after the smoke cleared we realized that we hadn’t made any contact. 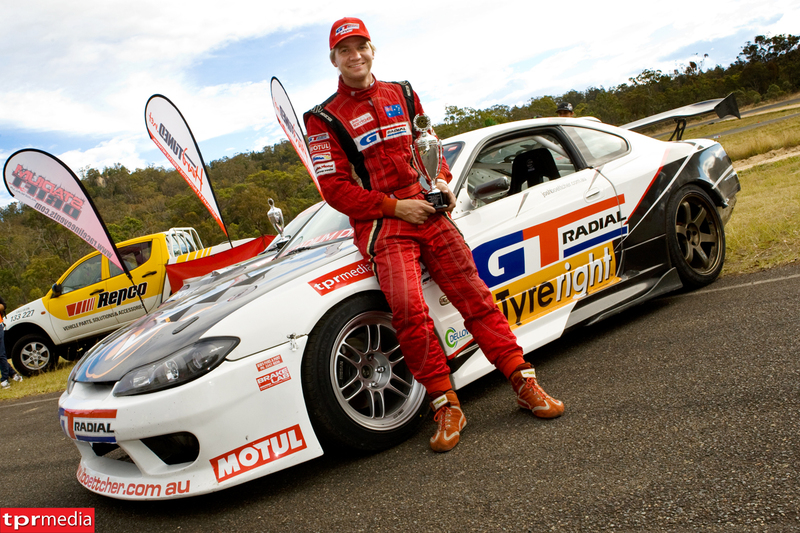 It was pretty close call considering we were putting the S15 on a boat only a few days later, so I was happy to come out clean. The next run I was able to stay calm and make no mistakes, so we were through to the final! 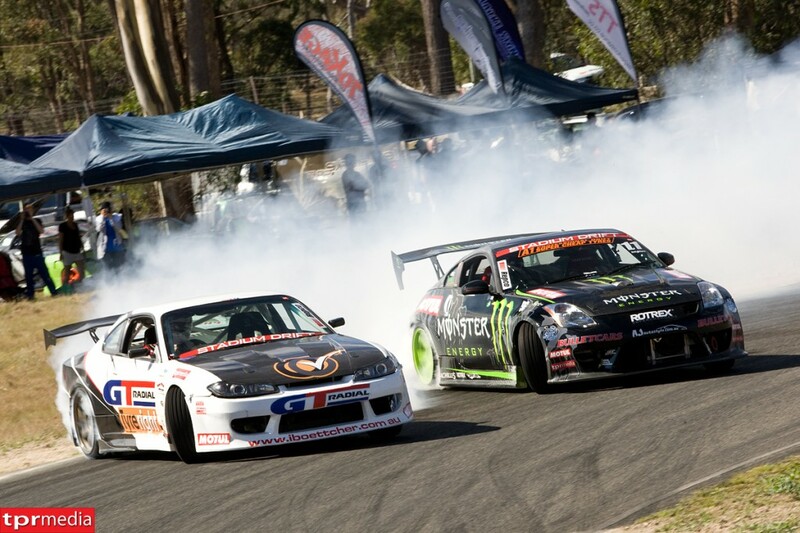 We were up against long term rival and Motul team mate Rob Whyte in his Monster Energy 350Z! Rob had qualified first and been on point all day! So again, we had our work cut out for us. We battled it out, both pushing super hard. On the chase run I was able to stay close to Rob, but not right on him. On my lead run I knew Rob was super close, so I throw out as much angle as I could to try and make a difference. But Rob was able to match my angle and stay right on my door. So the results were in, Rob 1st, Josh 2nd and Michael Rosenblatt 3rd. It was a tough day of battles, but a lot of fun! And it was great to come away with a podium before shipping the car off to Malaysia! The next round for us here in Australia is Round 3 at Wakefield Park down in Goulburn on May 12th & 13th. 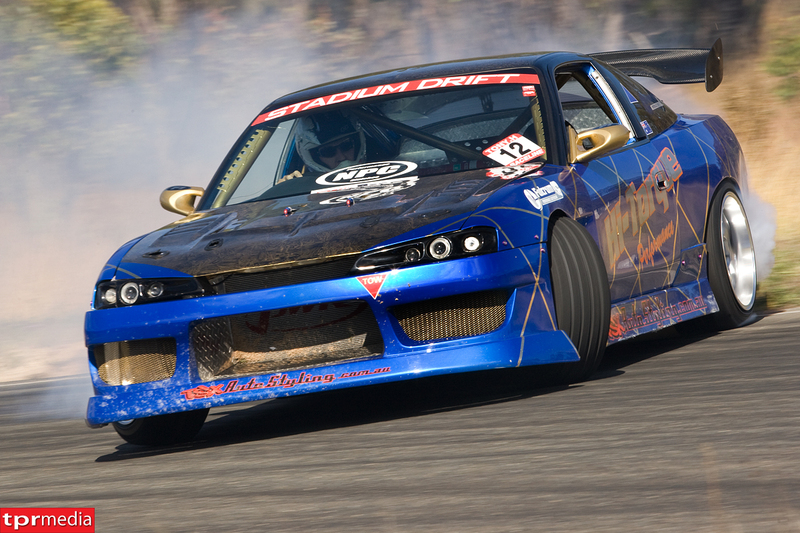 And we’ll be bring the all new Tyreright S13! Keep checking in to see updates as we finish the build of the S13 and get it ready to take on the Repco Pro Drift Championship! 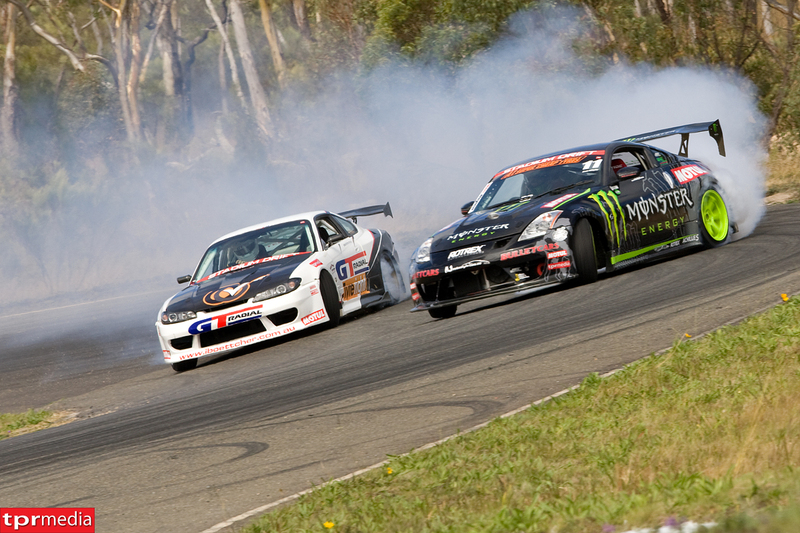 Then it’s time for Formula Drift Asia 2012 Round 1 in Malaysia at Speed City on the 19th and 20th May!